GSWR Register of Officers and Servants, [IRRS]. GSWR record for Blennerhassett Cashel. Book 10 p.184. Book 12 p.305. Book 13 p.145. Book 14 p.169. GSWR record for George E. Cashel. Book 12 p.293 and p.306. Family record of births and deaths. Looks like written at the time (in the 1870s). 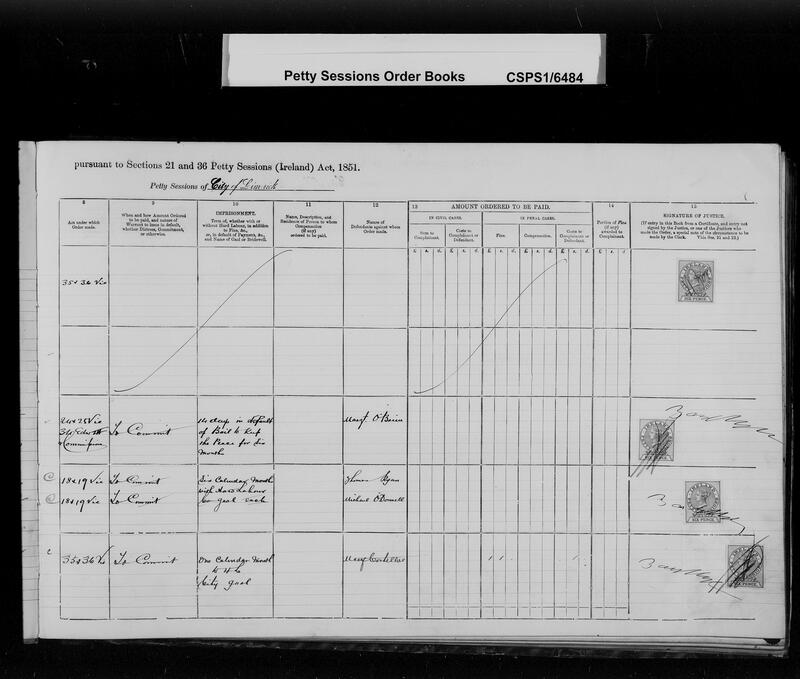 Search newspapers for 1872 Petty Sessions case. Search newspapers for 1889 Petty Sessions case. (Left) Blennerhassett Cashel. See full size and original. (Right) Maria Agnes Lyons. Photo in Cork, pre-1896. See full size and original. "tall, slim and handsome, with a drooping moustache" [PAT/12, p.16]. Blen worked for Great Southern and Western Railway (GSWR) for 45 years (1866 to 1911). His brother William Henry also worked for GSWR. Blennerhassett was appointed to GSWR on 23 Apr 1866 [GSWR record], age 17. He "had very little of the world's goods .. but he envied no man" [PAT/12, p.16-17]. See all the stations he was based at. He was based at Mallow, Co.Cork, 1869 to 1872. Listed as "clerk", living Mallow, at mar 1869. 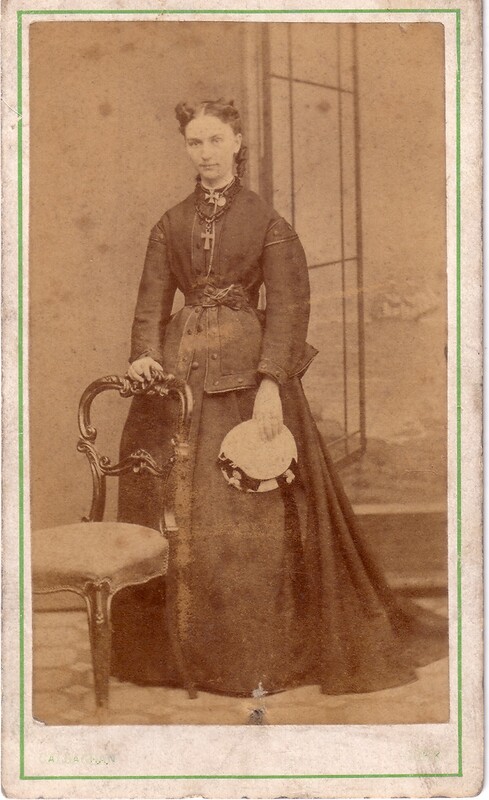 Blen mar 1stly, 30 Sept 1869, Cork, to Maria Agnes Lyons [born 1846]. He went to USA in 1870 to find his brother Edward. He had to resign from railway 9 Mar 1870 [GSWR record] in order to take the leave. Was in New York as at June-July 1870. Came back to Ireland. Reappointed to railway 4 Aug 1870 [GSWR record]. His job at Mallow was clearly kept for him. Living Main St, Mallow (see map) at dau Agnes' birth and bapt, Dec 1870. Listed as "clerk", living Main St, Mallow, when he registered Agnes' birth with [GROI] on 5 Jan 1871. Living Landscape Terrace, Mallow, at dau's bapt, May 1872 (near Market Place, this is same place as New St and New Road, see 1829 to 1842 map and 1887 to 1913 map and modern map). At dau's birth, May 1872, he is listed as "railway clerk", living New St, Mallow. He appeared as a witness in a case involving GSWR at the Petty Sessions at Aghern, Co.Cork (see map) on 25 Nov 1872. The case was about a man travelling without a ticket on 21 Oct 1872. Blen was a witness. The defendant had to pay a sum to the GSWR. See image. 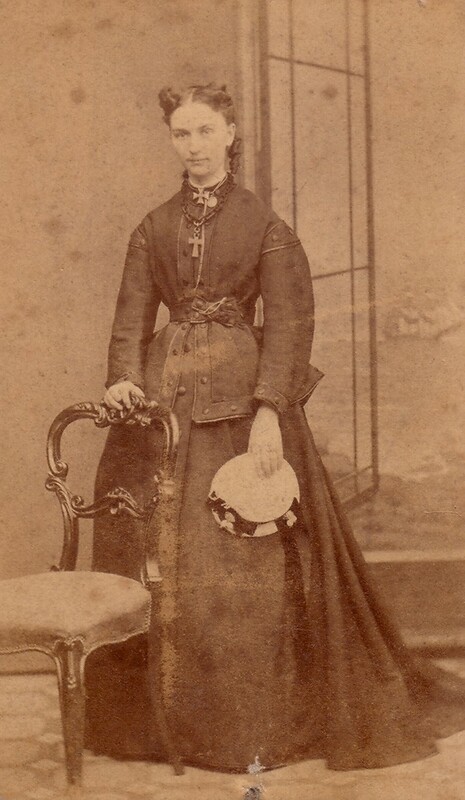 Blen sp bapt of his niece Mary Agnes Sheahan in July 1873. 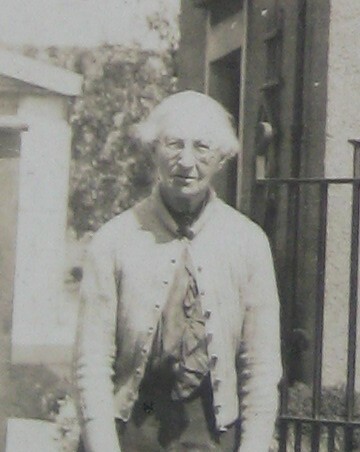 He was station master at Banteer, Co.Cork, 1873 to 1874. Listed as "station master" in Banteer at Eileen's birth, Aug 1873, and Annie's birth 1874. He was station master at Newbridge, Co.Kildare, 1875 to 1877. Listed as "station master" at Railway Station, Newbridge, Co.Kildare, at Willie's birth 1875 and John's birth 1877. Blen was station master at Parsonstown (now Birr), Co.Offaly, 1877 to 1878. He became station master at Parsonstown 1877, taking over from his brother William Henry. [Freeman's Journal, 10 Aug 1877, p.5 centre, [NLI] microfilm] reports William Henry's move from the railway station at Parsonstown to Carlow, and his replacement at Parsonstown by his brother Blennerhassett, late of Newbridge. Listed as "station master" in Seefin (at or near Parsonstown station), Birr par, Co.Offaly, at Alice's birth July 1878 through Eileen's death Dec 1878. When Maria Agnes went away for a short holiday in 1878, three of her children fell ill. Four of her children would die in a few months. [PAT/12, p.16] says: "There had been a tragedy, common enough in those days. While Grandmother was away for a couple of days holiday, three of the children became ill. Grandmother rushed home only to see them die of diptheria." Willie and John died Sept 1878. The story was that Agnes went on the holiday with her mother. Agnes remembered little 2 year old Willie leaning out the window as they pulled away, never said goodbye. I also had the story that it was the Tralee relations they went to. [PAT/12, p.16] says: "Within that same year two other children got typhoid and these also died." Annie died Nov 1878. Eileen died Dec 1878. There may also have been a child Daniel. As at Sept 1878 they had 7 children. By Dec 1878 they had only 3 children. Only no.1, no.2 and no.7 survived. "They say Grandmother never really got over it. She was never again full of fun and laughter, and she was still young when she died." Blen was station master at Thurles, Co.Tipperary, 1879 to 1880. They had another baby, Blennerhassett, who also died. Blen is listed as "station master", Great Southern and Western Railway (GSWR), living Railway Station, Thurles, Co.Tipperary, at Blennerhassett's birth 1879 through Blennerhassett's death 1880. Blen was station master (for GSWR only) at Limerick station Feb 1881 to 1893. Limerick station was shared among multiple rail companies, and he was GSWR head at Limerick, but not the head of the whole station. Cork and Limerick Direct Railway was part of GSWR, and this was its Limerick end. GSWR mainly did goods at Limerick at this time. [GSWR record] lists him as "station master". Blen travelled to London to give evidence at Bow Street on July 14, 1882, in the trial for treason of Thomas Walsh, of London. Walsh was charged with sending arms from London to individuals in Ireland. Blen reported how cases containing arms had arrived at Limerick station in Dec 1881. See The Times, July 15, 1882. See The Standard, London, July 15, 1882. See Blen's testimony here and here in the Trial of Thomas Walsh, 31st July 1882, in The Proceedings of the Old Bailey. Walsh was convicted and got 7 years. It is interesting that Blen's father was a policeman, he was a witness for the crown against subversives, and yet his children were Sinn Feiners. He is listed as "station master", GSWR, living Railway Cottage, South Henry St (later Carey's Rd), Limerick, at Madeline's birth, 23 July 1882. He appeared as a witness in a case involving the GSWR at Limerick Petty Sessions, 30 Aug 1889. The case was about theft of GSWR property at Limerick on 27 Aug 1889. Blen was a witness. The defendants got 6 months prison. See p.1 and p.2. He knew Stephen O'Mara from when he lived in Limerick. Their children met in Limerick summer 1891. He is listed in [Ashe's Directory, 1891-92] as "station master, Cork Direct Railway", residence Railway Cottage, Carey's Rd, Limerick (same place as previous). His brother William had lost his job in 1889, had a drink problem, moved in with Blen and family by 1891. William was listed at Carey's Rd, Limerick, when he was charged with being drunk in public in Limerick in July 1891. William committed suicide in Oct 1891. Blen is listed as "station master", living Carey's Rd, at William's death and when will proved Nov 1891 [NAI]. Blen is listed in [Guy's, 1893] as stationmaster, GSWR, Limerick. Blen was goods superintendant (for GSWR only) at Cork station from apparently 1893 to 1911. He moved apparently in 1893 to Cork as goods superintendant for GSWR. The new railway station at Glanmire Rd, Cork, opened 1 Feb 1893, replacing earlier buildings [Creedon, 1985]. Cork station served multiple railway companies. He was GSWR goods head at Cork. [GSWR record] lists him as Goods Agent, Cork Goods station. Listed in [Slater's Directory, 1894] as "Goods Manager" for GSWR at the new Glanmire Rd station, Cork. Lived 52 Lower Glanmire Rd, Cork, right beside the new railway station. Listed as "goods agent", living 52 Lower Glanmire Rd, Cork, as at Agnes' mar 1895. Maria Agnes died Fri 10th Jan 1896, 52 Lr Glanmire Rd, age 49 yrs [GROI]. Funeral Sun 12th Jan, bur St.Joseph's cemetery, Cork. Blen bought this plot on 12 Jan.
bapt 22 Dec 1870 [Mallow RC par records], sp William Henry Cashel and Mary Ellen Lyons. Note on bapt says: "William Henry Cashel represented by John Lyons". mar 30th Apr 1904, St.Patrick's, Cork [GROI], to Jack Riordan and had issue. died of "diptheria", Seefin, Birr par, Co.Offaly, 31st Dec 1878, age 5 yrs [GROI]. died of "inflammation of the bowels", 28th Nov 1878, Seefin, Birr par, Co.Offaly, age 4 yrs [GROI]. died of "croup", 8th Sept 1878, Seefin, Birr par, Co.Offaly, age 2 yrs [GROI]. died of "croup", 8th Sept 1878, Seefin, Birr par, Co.Offaly, age 1 yr [GROI], or 6 Sept [Family record]. Sinn Fein activist and County Councillor. died 7th Aug 1880, Railway Station, Thurles, of "diarrhoea", age 1 yr [GROI]. to William M. Conacher and had issue. 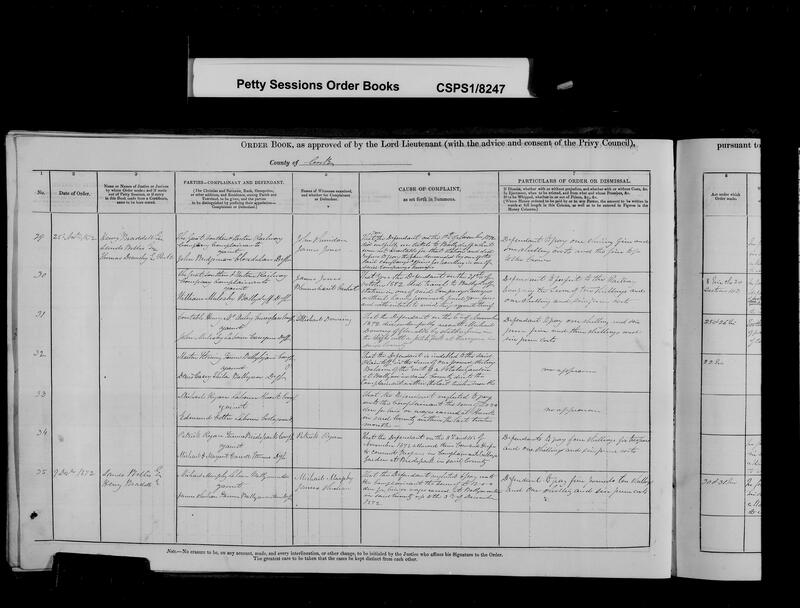 can't find in [GROI], NOT Daniel of Lismore, 1885.
to Marion Mc Swiney ["Aunt Mal", "Marion Clare" in census, born 1865 or 1867 or 1873, census says born Limerick, dau of William Morgan Mc Swiney, (poss. merchant)]. She was spinster, living 18 Liberty St (unidentified), Dublin, at time of marriage. Blen is described as "goods superintendant" at mar. Described as "goods manager" at Helen's birth 1899. They are listed in [Census, 1901] as living 52 Lower Glanmire Rd, Cork, he is "goods superintendant, GSWR", they have 1 servant living with them, [NAI] 81/98, microfilm. Listed as "superintendant", GSWR, living 52 Lower Glanmire Rd, at Kathleen's mar 1904. Despite his giving evidence against subversives in 1880s, [Lavelle, 1961] says he later approved of his daughters' Sinn Fein beliefs. They are listed at 52 Lower Glanmire Rd, Cork, in [Census, Apr 1911], he is "goods superintendant, GSWR". He moved to "Knocknacool", College Rd, Cork, must be at retirement 1911 (52 Lower Glanmire Rd was railway property, came with the job). See a simple "will" he made, 13 Sept 1913, leaving everything to his wife. Listed as "agent" at Madeline's mar 1914. Listed (after death) as "Railway Manager" at Helen's marriage. Blen was living "Knocknacool", College Rd, Cork, at death 1915. He died at his residence, "Knocknacool", Thur 21st Oct 1915, age 67 yrs, "railway superintendant" [GROI]. Death notice in [The Evening Echo, Cork, Fri 22nd Oct] and [Cork Examiner, Fri 22nd Oct], listed as "goods agent" at Cork for GSWR. Funeral Sat 23rd Oct, bur St.Joseph's cemetery, Cork. Funeral list in [The Evening Echo, Cork, Sat 23rd Oct] and [Cork Examiner, Mon 25th Oct]. See death notice in Irish Times, October 30, 1915. Admin of estate granted at Cork, 20th Dec 1915, to Marion. Admin survives in [NAI], no will. He is listed as "railway agent" and "goods agent", GSWR. Marion and dau Helen lived at Little Island, Co.Cork, for a time. They also lived near Carrigaline (near Cork) for a time. 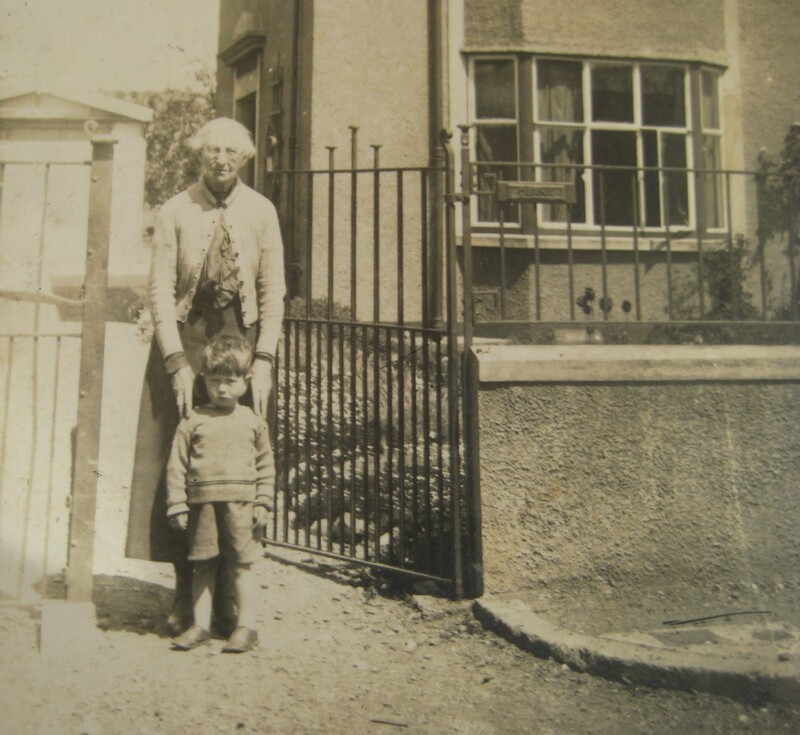 Marion was living 17 Knockrea park, Douglas Rd, Cork, with Helen and family at time of death 1940. Her will dated 26th Feb 1940, at Mercy Hospital, Cork, very short, all property to dau Helen. Admin of estate (with will) granted 28th Oct 1940 at Cork to dau Helen [NAI]. born "Helena Mary", 17th Oct 1899, 52 Lr Glanmire Rd, Cork [GROI]. Almost a generation younger than her half-siblings. Pat Lavelle in [PAT/12, p.18] described it that her grandfather "had a baby daughter for his old age. Helen was a year younger than me and we were very good friends." Helen was at Cashel House one time when her half-sister Alice was arrested (1920 or 1921), saw her driven off. She was living 5 Eldred Terrace, South Douglas Rd, Cork, at mar, think listed as "Typist". She mar 18th Aug 1926, Douglas, Cork [GROI] to Frank McGrath and had issue. 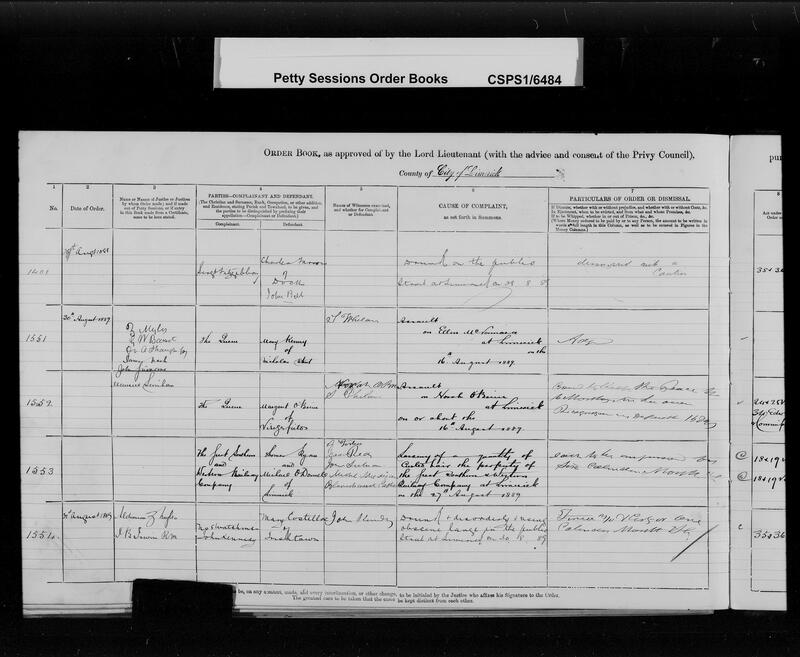 Baptism of Agnes Cashel, 22 Dec 1870 [Mallow RC par records]. Notepaper of Blennerhassett Cashel shortly before retirement 1911 is made out as "B.H. Cashel" and he signs it "B.H. Cashel". He may be using the style "Blenner Hassett Cashel". 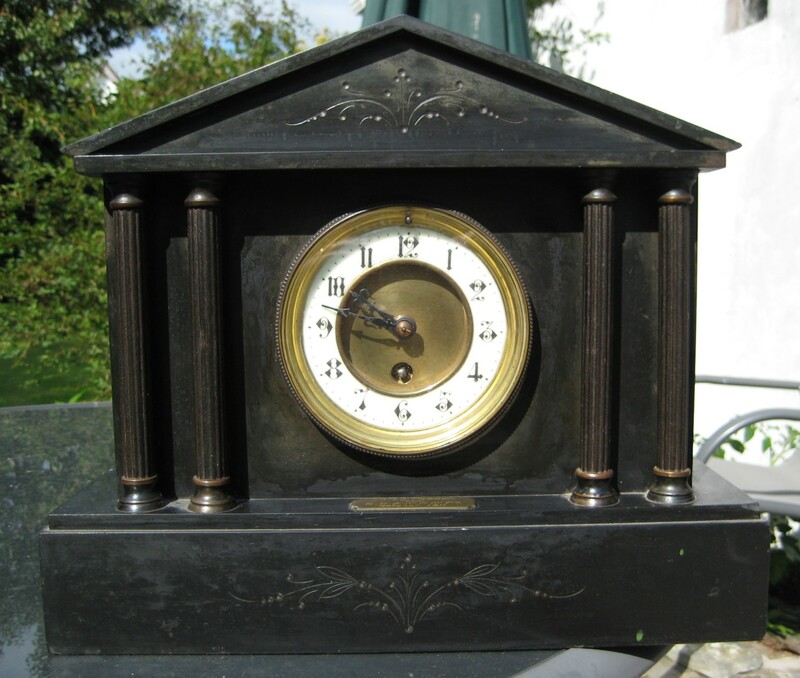 Clock given to Blennerhassett Cashel by GSWR at retirement, Oct 1911. Photo 2011. See larger and full size. See other shot. Inscription on the clock shows it is presented to "Mr. B.H. Cashel" (would stand for "Blenner Hassett"). Blennerhassett Cashel's 2nd wife Marion Mc Swiney and her grandson Jack McGrath. 17 Knockrea park, Douglas Rd, Cork. The house was called "Carna" after Carna in Connemara (see map) where they spent holidays. See wider shot and wider shot. 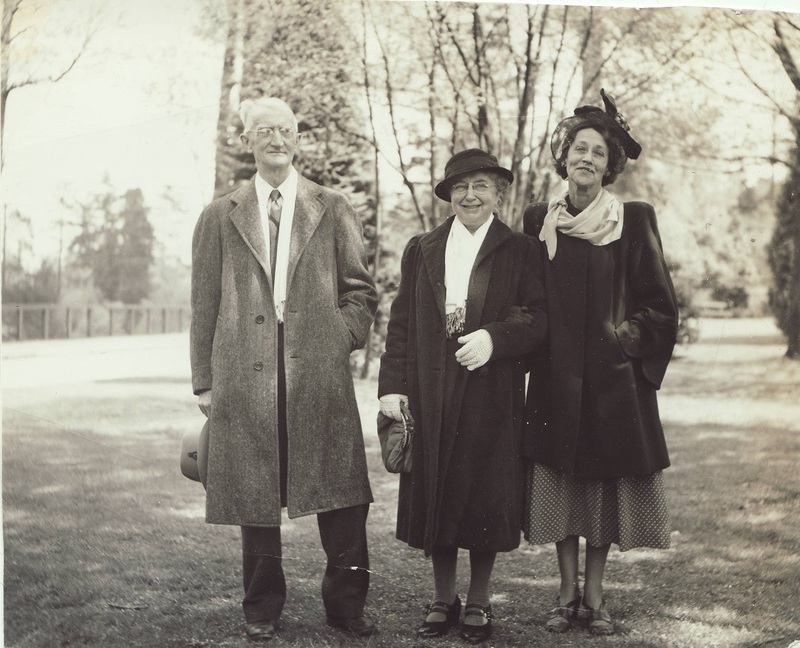 (Left to Right): George Cashel (George Edward Cashel, born 1880), his wife Maggie, and a Mrs. Stevens.